Periodontal diseaseis an infection of the tissues that support your teeth. Your gum tissue is notattached to the teeth as high as it may seem. 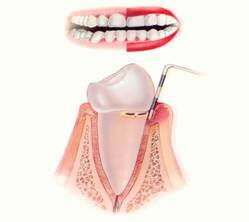 There is a very shallow v-shapedcrevice called a sulcus between the tooth and gums. Periodontal diseases attackjust below the gum line in the sulcus, where they cause the attachment of thetooth and its supporting tissues to break down. As the tissues are damaged, thesulcus develops into a pocket: generally, the more severe the disease, thegreater the depth of the pocket. Periodontal diseasesare classified according to the severity of the disease. The two major stagesare gingivitis and periodontitis. Gingivitis is a milder and reversible form ofperiodontal disease that only affects the gums. Gingivitis may lead to moreserious, destructive forms of periodontal disease called periodontitis. It ispossible to have periodontal disease and have no warning signs. That is one reason why regular dental checkups andperiodontal examinations are very important. Treatment methods depend upon thetype of disease and how far the condition has progressed. Good oral hygiene athome is essential to help keep periodontal disease from becoming more seriousor recurring. You don’t have to lose teeth to periodontal disease.Brush, clean between your teeth, eat a balanced diet, and schedule regulardental visits for a lifetime of healthy smiles.